The following list has been compiled by the Local Studies Librarian, Blue Mountains City Library. The newspapers are listed in a roughly chronological order. The accompanying historical information has been obtained principally from the newspapers themselves and from a paper, Blue Mountains Newspapers by J. Ralph Bennett, first published by the Blue Mountains Historical Society in February 1952, extended and read to the Springwood Historical Society in March 1973 and later published in a revised form in Old Leura and Katoomba (Rotary Club of Katoomba, 1981). The Gazetteer of NSW Country Newspapers (on computer data base at UWS Nepean) compiled by Nightingale and Liston from newspaper registration files held by the Archives Authority of NSW was also a valuable reference against which to check information. Rod Kirkpatrick of the Department of Journalism, University of Queensland, Jim Smith of Wentworth Falls, Gwen Silvey and Alan Tierney of the Blue Mountains Historical Society and Reg Baumgarten and Ron Brazier of the Mount Victoria & District Historical Society also contributed significant information. The list excludes tourist newspapers, ie. newspapers aimed exclusively at tourists. Where a long run of a newspaper is indicated as being held, there may still be some individual issues missing. These are generally indicated on the microfilm at the beginning of each reel. Where particular issues and runs not included in the Blue Mountains City Library’s collection are known to be held by other organisations, this has been indicated. The Nepean Times (Penrith), The Lithgow Mercury and The Clarion (Lithgow), though based outside the Blue Mountains, contain much relevant material. The Blue Mountains City Library holds The Nepean Times (3 March 1882 to 29 November 1962) and The Lithgow Mercury (4 January 1901 to 31 December 1964) on microfilm. The Clarion (1932-1974) is held by the Lithgow Regional Library. Runs of several other Penrith papers which circulated in the Lower Blue Mountains, including The Penrith Press (1952- ), The Nepean Herald (1968-1973), The Penrith District Star (1973-1986), The Penrith City Star (1987-1995) and The Fairfax Sun: Penrith Edition (1995- ), are held by Penrith City Library. The Blue Mountains City Library would welcome donations of newspapers that fill gaps in our collection. Even single issues can be of great value to historians. For further information, the Local Studies Librarian can be contacted at Springwood Library, phone: 02 4723 5044. According to Bennett the first newspaper on the Mountains was The Mountain Advertiser which, he says, appeared in the mid-1870s in Katoomba (or The Crushers as it was then known). No copies of this paper have survived and no other reference to it has been found. In early 1889, the year Katoomba became a municipality, George W. Spring established The Katoomba Times which ran under his sole proprietorship until September 1890 when George P. C. Spring (Jun.) and J. Albert Southwood took over. Under a revamped banner the paper continued publication until 1894 when Spring and Southwood moved to South Australia. In October 1890 the paper relocated from its original office in Main Street “to more central premises, near The Carrington, and opposite the railway station.” It circulated between Hartley and Springwood. The Blue Mountains City Library holds microfilm copies of The Katoomba Times covering the period 25 May 1889 – 15 June 1894 [1 reel]. In the early 1890s another newspaper, The Blue Mountain Express, was established in Katoomba by Walter Henry Bone and Mr Upton. No copies have survived, but in its short life it apparently passed through the hands of a number of proprietors and its relationship with its competitor, The Katoomba Times, appears to have been less than friendly. It ceased publication at the end of July 1892 and the editors of the Times marked its passing with a satirical obituary. 7 September 1894 – 28 August 1896. Single copies: 18 June 1897; 22 June 1897; 18 March 1898. 6 January 1899 – 28 December 1900. 4 January 1901 – 29 December 1905. Single copies: 6 December 1907; 24 December 1908. The Mount Victoria & District Historical Society holds in hard copy a 4 page supplement to the issue of 22 January 1897. The Blue Mountains Historical Society holds the following single issues in hard copy: 9 November 1906; 16 October 1908 (incomplete); 25 December 1908 (incomplete). Bennett mentions another paper he claims was operating in the 1890s – The Observer. However, no other references to it have been found and there are no copies extant. 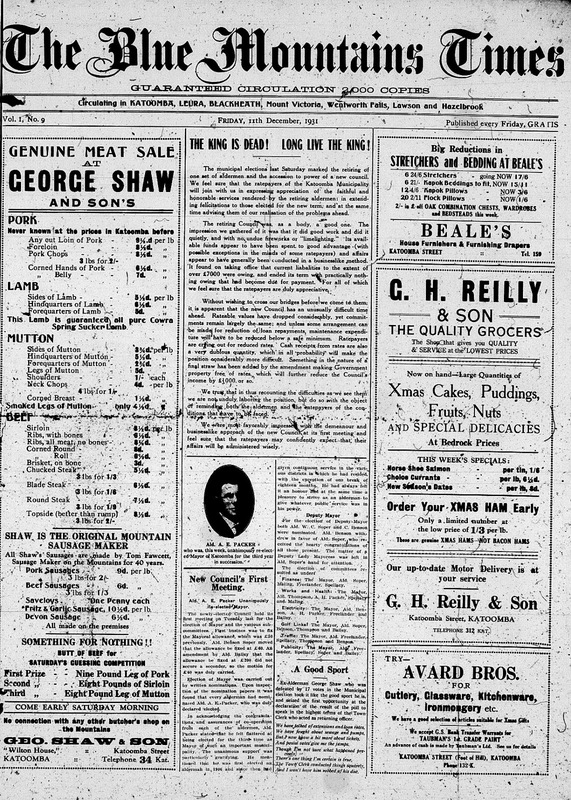 In January 1903 The Blue Mountain Gazette was launched in Katoomba by E. D. Wilson who set up his business in Main Street. Twelve months later, in January 1904, Wilson sold his interest in the paper to Robert Gornall. 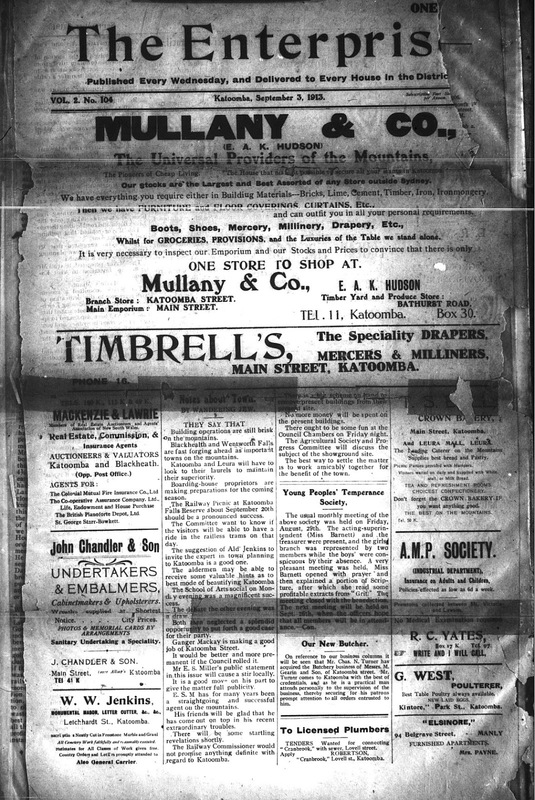 Gornall sold to John Knight of The Mountaineer in December 1904 and transferred his printing plant “to a prosperous and rapidly rising mining and agricultural town in the north, where there is no newspaper.” The Gazette, which had circulated throughout the Blue Mountains and adjoining areas, was incorporated with The Mountaineer. 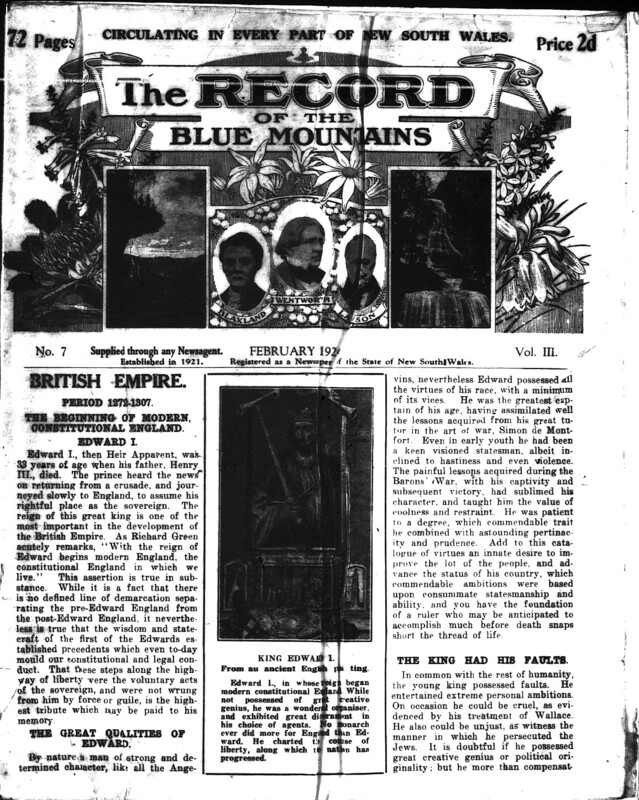 The first issue of The Blue Mountain Echo, circulating between Mount Victoria and Glenbrook, was published on 6 March 1909 under the management of James C. Hart for the Mountaineer Printing and Publishing Company at the Park Street premises of the old Mountaineer. Hart retired in February 1910, when Robert Villiers Smythe arrived from North Queensland to take charge. Smythe remained editor for almost the life of the paper, resigning as Managing Editor in November 1928 along with the Board of Directors of the Company. 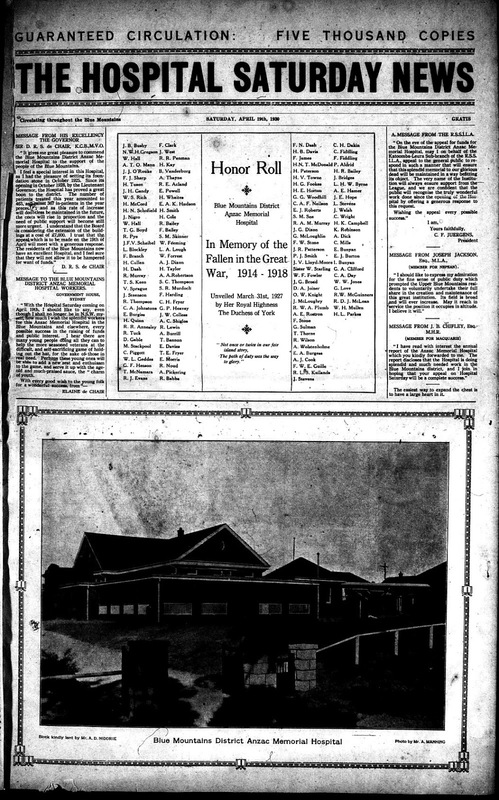 The new management closed the paper down with its issue of 28 December 1928 (Vol.39, No.82) and began publishing The Blue Mountain Star in January 1929. 7 March 1913 – 26 February 1915. 7 March 1919 – 25 February 1921. 3 March 1922 – 23 February 1923. In 1909-10 the mid-Mountains entered the newspaper scene with the appearance of The Lawson Post, published by Lawson businessman W .Lowden. It lasted six months (twenty-six issues) during which time, according to its proprietor, it had to contend with some belittling opposition from some sections of the community. The only known surviving copy is No. 26 (16 April 1910), the last issue. This was located by Jim Smith in a second-hand book shop in Sydney and was re-published in facsimile by him in the mid-1980s. Facsimile copies are held in the Local Studies Collection. 3 September 1913 (Vol.2. No.104). This issue was “printed and published by W. Hickson, Proprietor, Katoomba Street, Katoomba”. the Echo says the proprietors were “Messrs Hickson and Millard”. It is not known when it ceased publication. 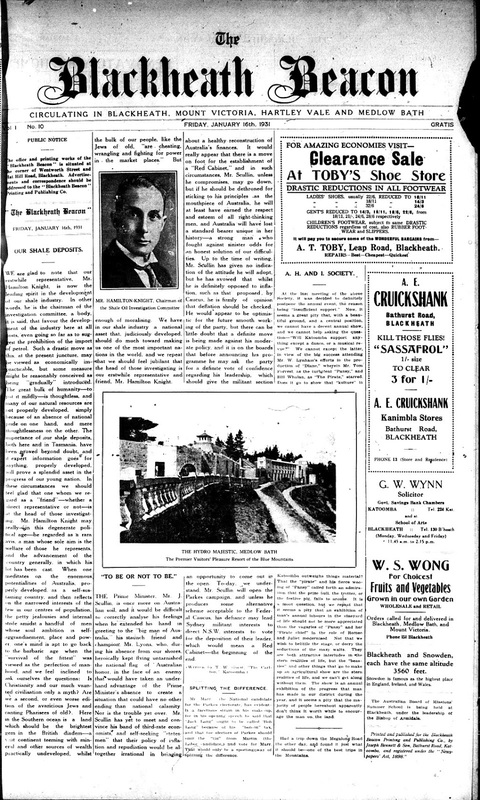 The July 1919 issue was printed and published by Charles Gordon Buchanan at premises in Main Street, Katoomba. Buchanan had previously worked for the Echo. By February 1920 the paper was in the hands of J. M. Bennett. The Blackheath Free Press probably began publication at the start of 1920. It circulated in Blackheath and Mount Victoria and was published and printed by J. M. Bennett at his Main Street, Katoomba, office. It is not known how long it survived. The Blue Mountains City Library holds a poor photocopy of the third issue, 6 February 1920 (Vol.1, No.3), in its Local Studies Section. No other issues are known to exist. 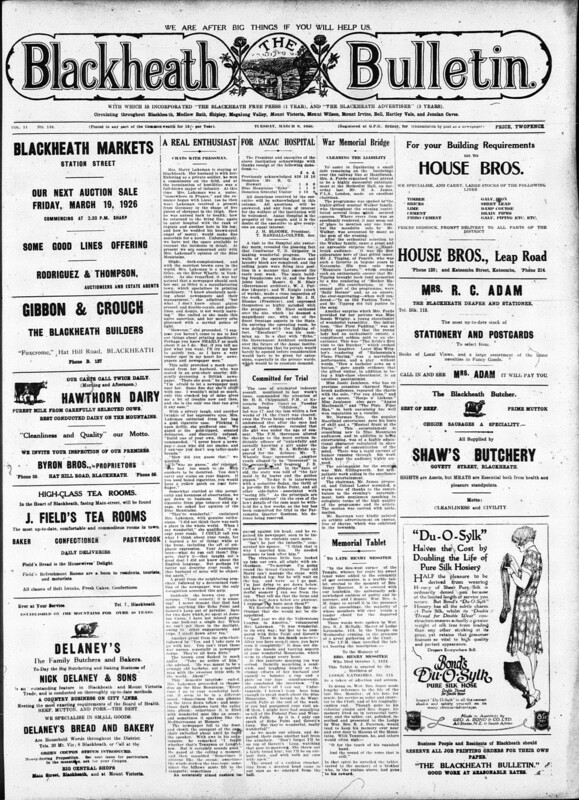 By July 1922 The Blackheath Free Press had been incorporated into another newspaper, THE BLACKHEATH ADVERTISER. This paper was printed and published in Katoomba by John Charles Boden and circulated free throughout Medlow Bath, Blackheath, Megalong Valley, Mount Victoria, Bell, Mount Wilson and Hartley Vale. It is not known when it began or when it ceased publication. Probably beginning in early 1920, this was a local section incorporated in the Sydney newspaper Smith’s Weekly. The latter was owned by Sir James Joynton Smith who had extensive business interests in the Blue Mountains. It is not known how long the local section survived and the library holds no copies. The Blue Mountains Historical Society holds a hard copy of the issue of 31 January 1920. It is possible that The Katoomba Daily grew out of The Mountain Daily (See Bennett’s paper). If this was so, the change had taken place by December 1920. 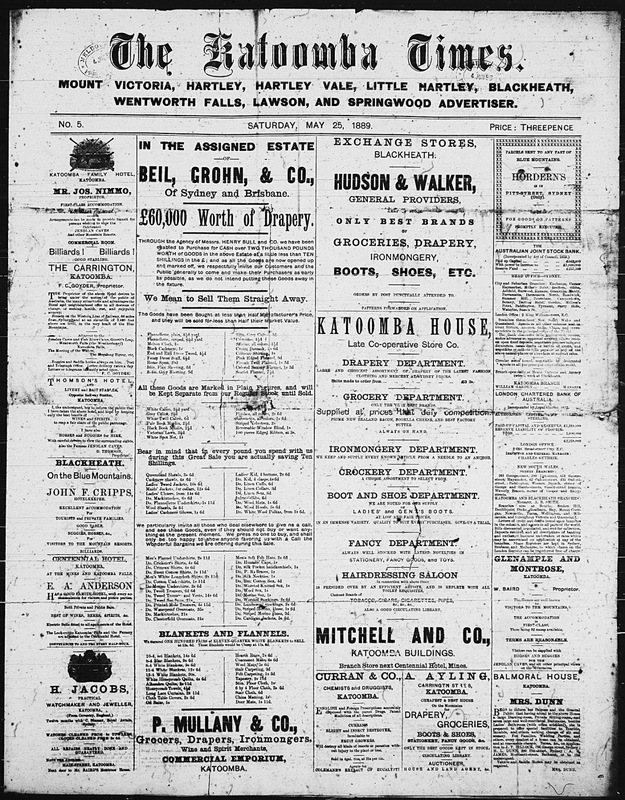 It appears that the The Katoomba Daily was originally owned by the Smith’s Weekly Publishing Co. Ltd. and was printed and published by Robert Clyde Packer in North Sydney. By July 1924 the printing and publishing of the paper had moved to the Katoomba Daily Printing Works, Froma Lane, Katoomba, and was under the supervision of Austin Mays. Sydney Lochlan Ward (November 1924-?) and Edmund Joseph Collins (ca1927-?) are other editors/publishers mentioned during the 1920s. Sometime in the late 1920s Blue Mountains Newspapers Ltd. began printing and publishing The Katoomba Daily at its office in the Echo Building, 23 Parke Street, Katoomba. From its issue of 21 July 1932 the Daily’s banner carried the addition: “With which is incorporated The Blue Mountain Echo, The Blue Mountain Star and Blackheath Bulletin”. By 1932 it was circulating between Lithgow and Penrith. 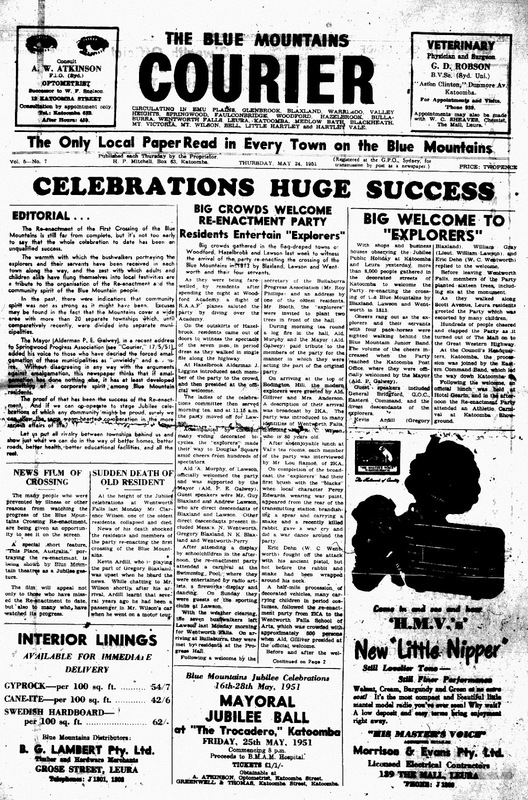 In 1939 the name of the paper was changed to THE BLUE MOUNTAINS DAILY (from the issue of 18 February) in recognition of its aim to meet “the publicity needs of all towns between Glenbrook and Mt. Victoria.” The new name proved to be a hint of greater changes to come and the paper closed with its issue of 9 May, 1939. The paper’s management issued a statement to the effect that it felt “that the rapid expansion of the Blue Mountains district warrants a larger and better paper to minister to its needs.” In its place they launched The Blue Mountains Echo. 1920 – 1931 [1 reel]. VERY incomplete !! Other than for the period July-December 1924, this is a collection of disparate single issues. 2 February 1932 – 9 May 1939 [4 reels]. 3 July 1934 – 31 December 1938 (5 volumes). 2 April 1921 – 25 March 1922 (complete run of Saturday editions). 4 April 1921 – 30 July 1921 (complete run of Wednesday editions). The Blue Mountains Historical Society holds the following single issues in hard copy: 16 April 1921; 14 May 1921; 7 February 1922; 30 May 1924; 1, 10, 24 March 1928; 18 April 1928; 8 May 1928; 18 August 1928; 28 September 1928; 16 July 1929 (damaged); 18 February 1930; 29 November 1930; 10 December 1930; 8 December 1931. August 1921 – July 1923 (September 1921 missing). Hard copy. February 1924. Hard copy and microfilm. The first issue was published on 14 March 1924. It was printed and published by Frank Walford at The Cumberland Times Printing Works in Parramatta and distributed throughout Katoomba, Leura and Blackheath. The Blue Mountains City Library holds a microfilm copy of only one issue: 23 May 1924. 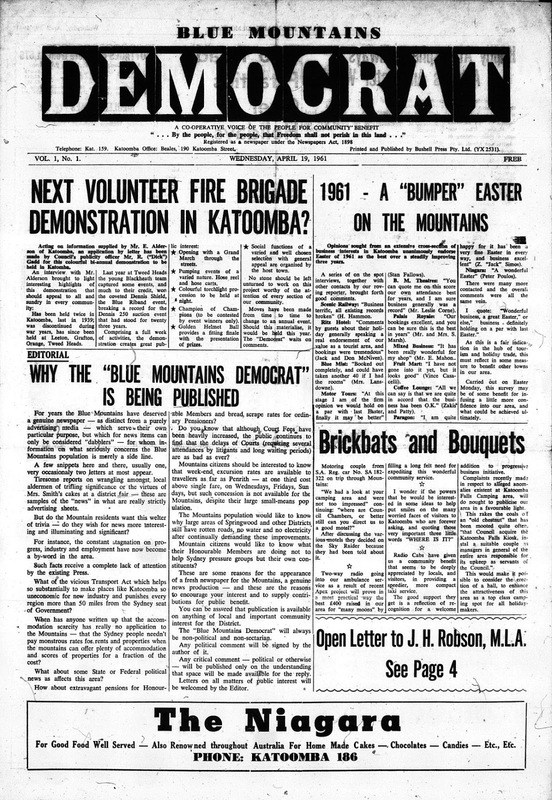 The Blue Mountains Historical Society hold a hard copy of the issue for 14 March 1924. 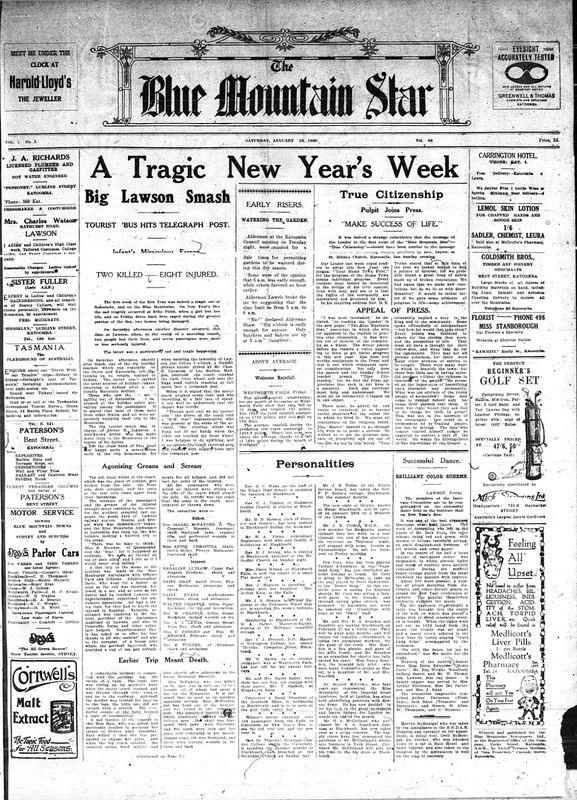 The first issue of The Blue Mountain Star, successor to the Echo, appeared on Saturday, 5 January 1929, printed and published by the Blue Mountains Newspapers Ltd. at their office in Parke Street, Katoomba, under the editorship of Victor Yeoman Mathias. The paper reached issue No.6 of Vol.3 (7 February 1931) when the management informed readers “that circumstances have arisen, largely due to the present trade depression, which will compel it to suspend publication of the journal temporarily.” The Star did not reappear. The Blue Mountains City Library holds microfilm copies of The Blue Mountain Star covering the period 5 January 1929 – 7 February 1931 [1 reel]. A paper known as The Blackheath Bulletin was published for a short period in the early 1920s (Vol.1, No.1 issued 1 May 1923) under the wing of The Blue Mountain Echo. No copies of this paper are held by the library. Jim Smith of Wentworth Falls, however, has a copy of the first issue in his collection. In 1929 it was resurrected by Blue Mountains Newspapers Ltd. and printed at The Star office in Katoomba. There seems to have been two distinct runs of this paper. The first, under the editorship of Victor Yeoman Mathias, appears to have been free and to have ceased publication by the end of 1929. The second, edited by W. E. Vincent, who had earlier been associated with the Echo’s Bulletin, began publication on 13 November 1930. Its thirteenth and final issue appeared on 5 February 1931. The offices of Vincent’s Bulletin were in “Oakdene”, Govetts Leap Road, Blackheath. 13 November 1930 – 5 February 1931. Issue No.8 (1 January 1931) is missing. The Chronicle was published weekly by Joseph Bennett and Edmund Collins (late editor of The Katoomba Daily) at Bennett’s office and printery on the corner of Bathurst Road and Cascade Street, Katoomba. 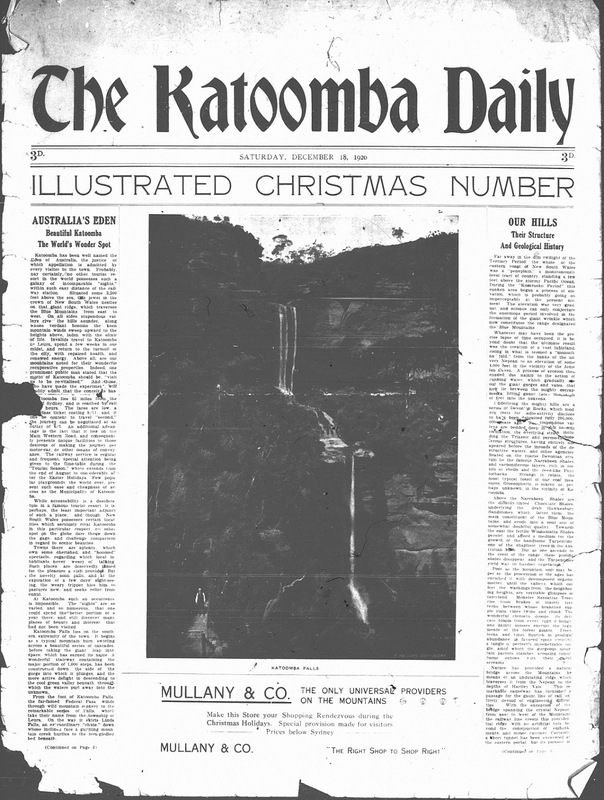 Beginning publication on Thursday 15 August 1929, it circulated in Katoomba, Blackheath and Leura for only nine issues. The editors spoke in their closing remarks of a “bitter campaign” waged against them from the start. The Katoomba Daily, it seems, lowered the cost of advertising to levels The Chronicle could not match. The Blue Mountains City Library holds microfilm copies of the paper’s nine issues: 15 August 1929 – 10 October 1929. Printed by Joseph Bennett and published for the Blue Mountains District Anzac Memorial Hospital Board by Charles Lawson Dash of Leura, this paper circulated throughout the Blue Mountains. When it began and when it ceased is unknown. The Blue Mountains City Library holds a microfilm copy of one issue: 19 April 1930. The Independent was owned, published and edited by Thomas Walter Guest and printed at the offices of Joseph Bennett & Son. 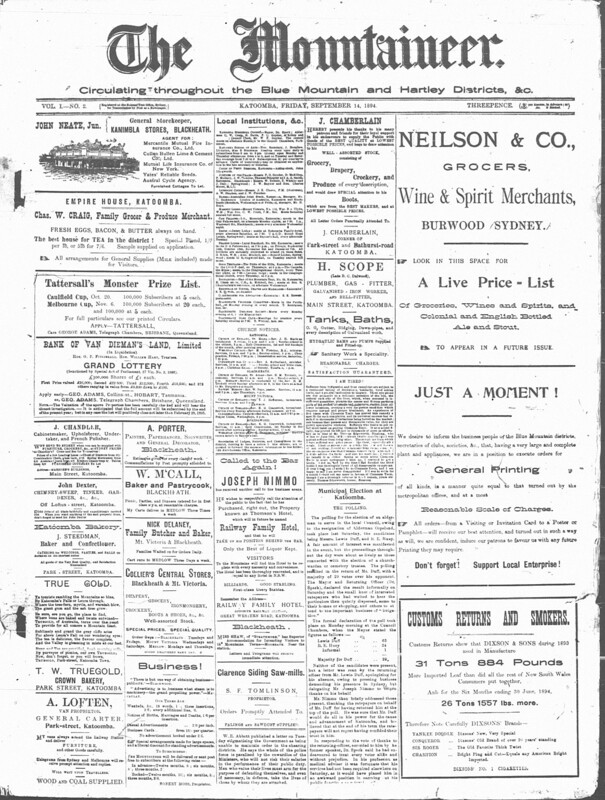 It began publication on Wednesday 14 May 1930, appeared weekly and circulated through Katoomba, Blackheath and Leura. It appears to have survived for just under a year. The Blue Mountains City Library holds on microfilm an almost complete run for the following period: 14 May 1930 – 5 March 1931. Joseph Bennett & Son began publication of The Blackheath Beacon in November 1930. A local office and printery was opened in Blackheath on the corner of Hat Hill Road and Wentworth Street and the paper circulated through Blackheath, Medlow Bath, Mount Victoria and Hartley Vale. However, the Beacon proved not to be “a paying concern” and the local office closed in February 1931. 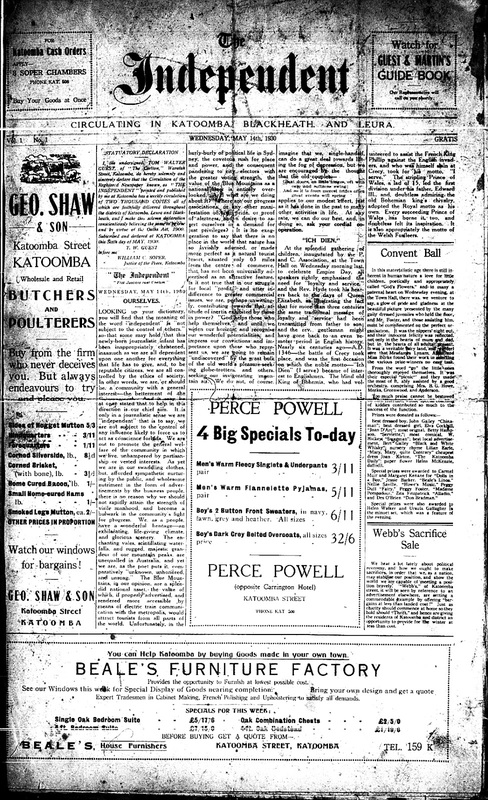 The paper continued to be printed at Bennett’s Cascade Street office in Katoomba for another month or so but finally ceased publication with its twentieth issue on 27 March 1931. The Blue Mountains City Library holds microfilm copies covering the period of the paper’s existence: 7 November 1930 – 27 March 1931. Issues 1-8 (ie 7 November 1930 – 2 January 1931) are very badly damaged. The top half of each page has been torn off. 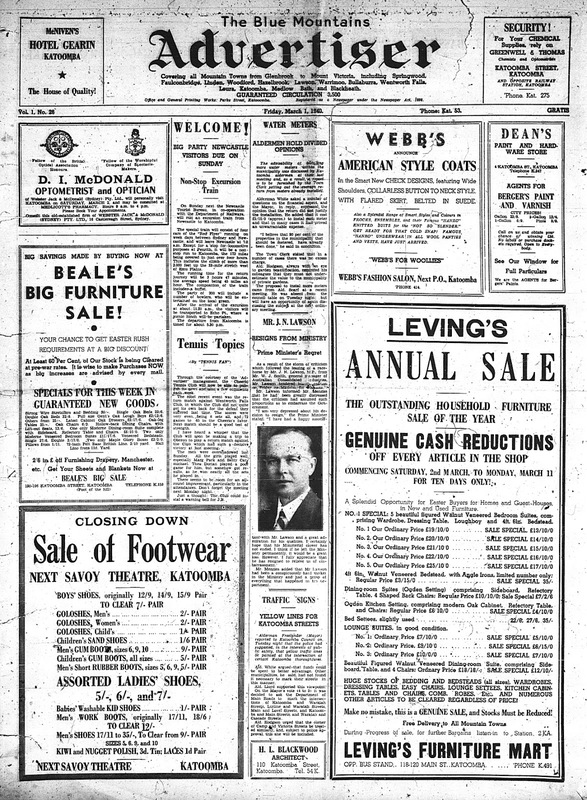 Issue No.3 (21 November 1930) is missing. A facsimile copy of issue No.5 (5 December 1930) was published some years ago and a copy is held in the Blue Mountains City Library’s Local Studies Collection. These are INCOMPLETE runs and are held on 1 reel. The Blue Mountains Historical Society holds in hard copy the following single issues not included in the above runs: 23 September 1932; 19 May 1933; 25 August 1933; 23 November 1934; 28 June 1935. Published by the Blue Mountains Daily Pty., Ltd., at its office in the Echo Building, 23 Parke Street, Katoomba, the first issue of the new Echo came out on Friday, 12 May 1939. 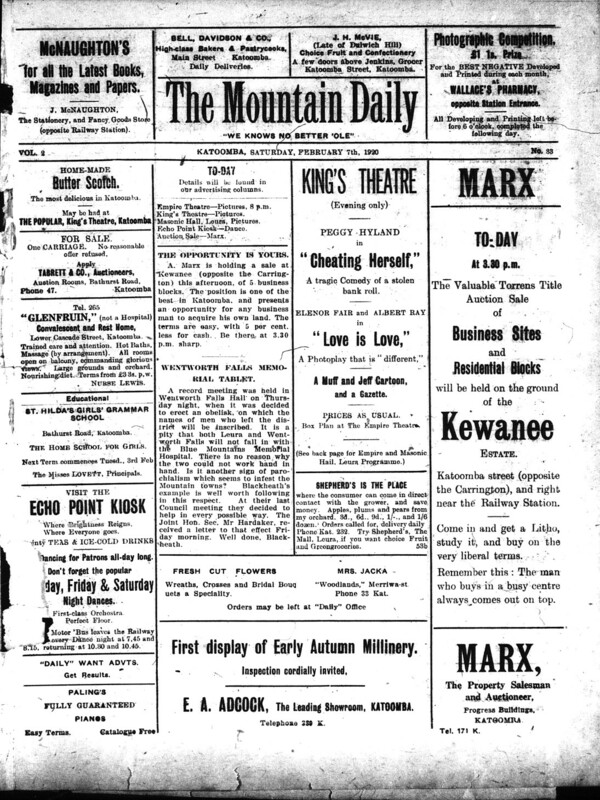 Its banner carried the addendum “Formerly The Blue Mountains Daily”. It was published bi-weekly and, while it is not certain when it closed, its life was not a long one. The Blue Mountains City Library holds microfilm copies of The Blue Mountains Echo covering the period 12 May 1939 – 17 October 1939 [1 reel]. The Advertiser was a weekly paper that began publication in 1939, though no early issues are extant. It was established by James Robert Wighton, a former compositor with the Daily, and Mr Cecil Thomas Roberts and the early issues were printed at Parramatta. From issue No.20 (19 January 1940), however, it was published by Wilfrid Mason and printed at the Daily office, 23 Parke Street, Katoomba. Its circulation encompassed virtually the whole of the Blue Mountains, from Glenbrook (and later Emu Plains) to Mount Victoria. In June 1942 Mason’s name disappeared from the paper and the publisher was listed simply as “Blue Mountains Daily Pty., Ltd.” Sometime during the period January – July 1948 the paper began to be printed in Parramatta again, at the office of Cumberland Newspapers. On 4 October 1948 The Advertiser moved to 134 Katoomba Street and the Parke Street office, after such a long newspaper history, was finally closed and the plant dispersed. From this date a succession of companies were listed as proprietors: “The Blue Mountain Advertiser Co. (to April 1949); “Blue Mountains Newspaper Co.” (to ca.1957); “Summit Newspapers” (from ca.1957 to October 1965). From October 1965 the Advertiser was printed and published by Cumberland Newspapers, Parramatta, with the local office remaining at 134 Katoomba Street, Katoomba. 19 January 1940. 3 August 1961. 1 March 1940. 3 January 1963 -25 May 1978. 1 July 1941 – 31 December 1947. 16 July 1948 – 30 December 1954. The Blue Mountains Historical Society holds in hard copy the following single issues: 5, 26 January 1940; 2, 9, 16, 23 February 1940; 8, 15 March 1940; 6 October 1955; 25 February 1960 (incomplete). The Mount Victoria & District Historical Society holds in hard copy the following single issues: 11 January 1962; 17 May 1962; 28 June 1962. No copies of the News have survived, though Bennett says it was first published in July 1947 by Leslie John Hanks. By March 1949 it appears to have been taken over by Cumberland Newspapers and published in tandem with The Blue Mountains Advertiser – the News early in the week, the Advertiser at the end of the week. How long this went on is unknown. It circulated between Springwood and Mount Victoria. Bennett says that this short-lived sporting paper was founded ca1948 by Adrian Twigg, formerly the local (Katoomba) representative of The Blue Mountains Advertiser. No copies have survived. The Courier was another weekly newspaper which appears to have begun publication ca1947, though copies of early issues have not survived. It was established, according to Bennett, by Frederick George Carden of Springwood and it is his name that appears on the earliest issue extant (16 September 1948, Vol.2, No.29). The paper was printed in Sydney by Gowans & Giltrow. Carden eventually sold the paper (ca1950) to a journalist, Marjorie Plunkett, who published it until 1951. By May 1951 the Courier was in the hands of H. P. Mitchell. It changed owners again in 1953 when James Arthur Mahoney took the helm and set up his own printing plant, including a flatbed press, linotype machine and composing facilities, in the garage of his home in Wentworth Falls. By October 1955 he had moved the plant to Froma Lane in Katoomba, using premises at the rear of the Carrington Hotel. Mahoney sold the Courier to Keith Leonard Newman in December 1959. Sometime between July 1960 and August 1961 Newman sold to Cumberland Newspapers and the Courier was incorporated into its long-time competitor, The Blue Mountains Advertiser. Circulation of the paper was originally from Glenbrook to Blackheath, expanding in a few years to include the region between Emu Plains and Hartley Vale and eventually also taking in St. Marys and Penrith. 4 August 1955 – 12 January 1956. 7 June 1956 – 14 July 1960. The Blue Mountains Historical Society holds the following single issues in hard copy: 11 October 1951; 19, 26 January 1956; 2, 9, 16, 23 February 1956; 1, 8, 15, 22, 29 March 1956; 5, 12, 19, 26 April 1956. 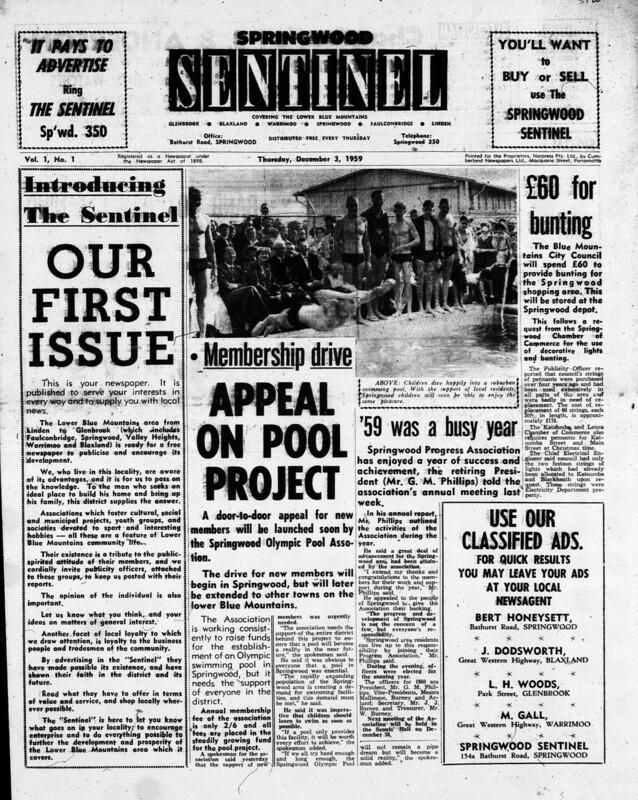 The first issue of the Sentinel was published on 3 December 1959. It was a weekly newspaper designed to cater for and promote the Lower Blue Mountains (Linden to Glenbrook). Printed in Parramatta by Cumberland Newspapers for the proprietors, Norpress Pty. Ltd., its local office was situated at 154A Bathurst Road, Springwood. 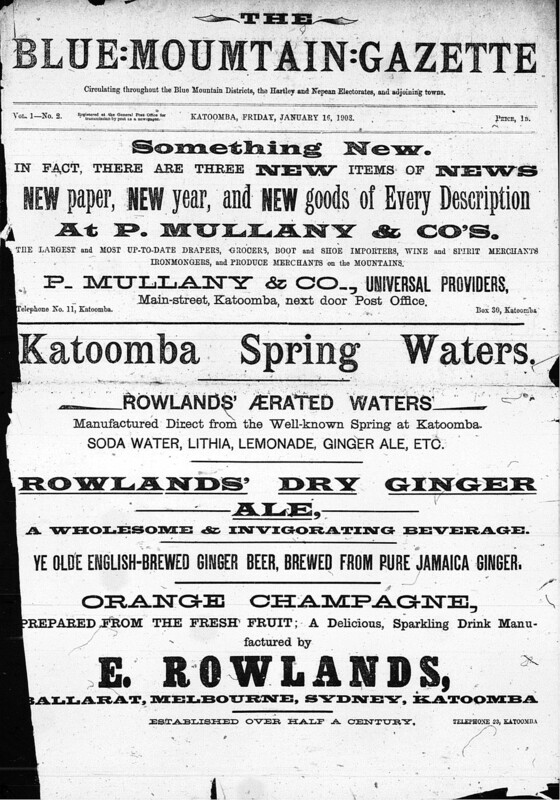 According to Bennett, the paper lasted only a few months before it was incorporated in The Blue Mountains Advertiser. The Blue Mountains City Library holds a hard copy and a microfilm copy of: the issue for 3 December 1959 (Vol.1, No.1). According to Bennett the Democrat was founded by a Medlow Bath saw miller with an interest in politics, Leslie Cant. The first issue appeared on 19 April 1961. Its office was located at 190 Katoomba Street, Katoomba, and it was printed and published by Bushell Press Pty. Ltd. Its banner carried the addendum: “A Co-operative Voice of the People for Community Benefit / ‘By the people, for the people, that Freedom shall not perish in this land’.” While it appears that the life of this weekly newspaper was not long, it is not known exactly when it closed. The Blue Mountains City Library holds a microfilm copy of the issue for 19 April 1961 (Vol.1, No.1). The first issue of the News appeared on 17 December 1968. It was edited by Tony Marinato and published for the Blue Mountains Tourist Centre, 216 Katoomba Street, Katoomba. Initially the paper circulated between Hazelbrook and Mount Victoria (including Megalong Valley) but, by June 1969 its area had expanded to include Springwood and Hartley. How long it survived for is unknown. Appears to have changed its name to THE BLUE MOUNTAINS-LITHGOW DISTRICT NEWS ca.1969/70. The Blue Mountains City Library holds microfilm copies for the period 17 December 1968 – 24 June 1969. The Mount Victoria & District Historical Society holds hard copies of issues of The Blue Mountains-Lithgow District News for: 3 September 1970; 17 September 1970; 1 October 1970. Bennett records that a Katoomba businessman, Ian David Hawke, began publishing a paper called The Katoomba Times in January 1962. Nightingale & Liston, drawing their information from newspaper registration records, list the paper as The Blue Mountains Times. It lasted only four issues and no copies appear to have survived. The Circle began publication in 1962. It was published by Michael Edward and Anne Ticehurst of Faulconbridge. In October 1965 it was incorporated into The Mountain Gazette. No issues of this paper are available. The Mountain Gazette was begun in 1963 by a partnership of three men, Mr Barden (a printer), Mr J. M. Powell (a local businessman and alderman) and Mr H. Ragen (the first editor), under the name of BPR Printers, Springwood. When Bardon and Powell resigned their directorships Ragen recruited Mr T. Booker (one of the paper’s compositors), Mr B. Woolveridge (a printer) and Mr M. Ticehurst (the editor and proprietor of the rival Circle). The life of BPR printers was not a settled one. Following the resignation of Ragen and Woolveridge the company went into voluntary liquidation. Ticehurst and Booker were subsequently backed by Hawkesbury Newspapers and formed a new company, Mountain Press. 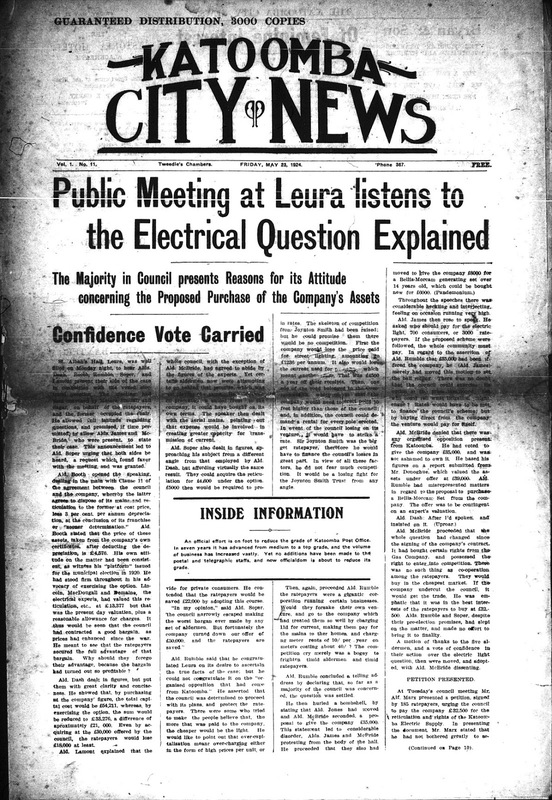 The first issue of the Gazette for the new owners was published on 25 August 1966. Despite the troubles and the change in ownership their was no break in publication. From 1963 to 1970 the Gazette’s office was in the basement of 210 Bathurst Road, Springwood. In 1970 the address changed to 218 Macquarie Road and, in 1977, the paper moved into its present premises at 274 Macquarie Road, Springwood. The paper was set up at Springwood and printed by Hawkesbury Newspapers at Windsor until that company sold out to Rural Press in 1982. Rural Press now own a major share in Mountain Press and continue to print the paper at North Richmond. The Mountain Gazette changed its name to THE BLUE MOUNTAINS GAZETTE from its issue of 15 August 1979. Its circulation has always been throughout the whole of the Blue Mountains area. 17 March 1966 – 17 December 1969 (Hard copy). Edited by Tony Marinato for the Blue Mountains Regional Tourist Association, this paper was possibly a successor to The Blue Mountains-Lithgow District News. It circulated throughout the Blue Mountains. The only issue extant is that for 23 June 1972 (Vol.2, No.23), held in hard copy by the Blue Mountains Historical Society. A small community news and tourist newspaper folded in magazine format. It was published by Mountain Studio (photographers and printers) at 5 Leichhardt Street, Katoomba and appears to have circulated from Mount Victoria to Hazelbrook. How long it survived is unknown. The first two issues, 21 December 1978 & 17 January 1979 are held in hard copy by the Blue Mountains City Library. The first issue of the Echo appeared, as an independent weekly, on 7 April 1981, under the editorship of Terence Cunningham. It circulated throughout the Blue Mountains and, by May 1981, had included Lithgow. The paper’s first publisher was a company known as Periot, with an office at 2/92 Katoomba Street, Katoomba (later, in 1982, moved to Froma Lane). 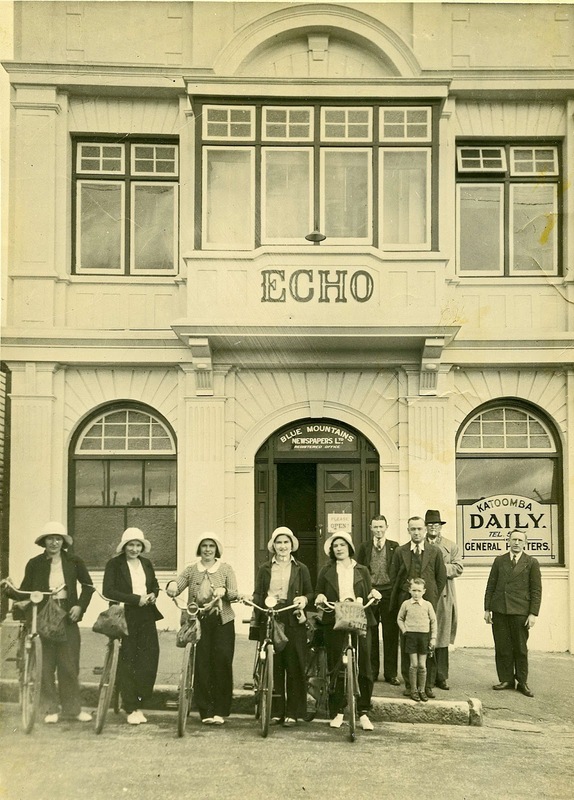 For the first couple of years the Echo was printed in various places, including Orange (by Western Newspapers Ltd. at the office of The Central Western Daily), Maroubra and Parramatta. During (probably towards the end) of 1985 the printing and publishing of the paper moved to Manly and the office of The Manly Daily. The local office moved to 202 Katoomba Street in 1985. In June 1987 the publisher became Rural Press and the paper was printed and published at North Richmond until its final issue of 27 June 1989. About 1988 the Katoomba Office moved a final time to 88 Katoomba Street. Spencer Ratcliff was appointed Managing Editor in May 1985 and filled that position until January 1989. For the period February – June 1989 the Managing Editor was Douglas Hayman. The Whisper, an independent monthly (occasionally bimonthly) with a satirical edge, began publication in November 1989. It was published in the upper Mountains by Mary Moody and Geoff Fanning, was printed by Spot Press in Marrickville and circulated throughout the Blue Mountains. Mary Moody was the editor. The last Whisper (No.16) appeared in September 1991, its demise linked to legal difficulties. The Blue Mountains City Library holds a complete run in hard copy for the period November 1989 (No.1) – September 1991 (No.16). The Weekender was launched in Katoomba in September 1991. Early publisher/editors were Nigel Wilson and Michael Lopez. It was published in Katoomba until November 1992 (issue 16) when it moved to the Lower Blue Mountains at Springwood/Faulconbridge. Here it was published and edited by Graham and Roslyn Reibelt. The Weekender moved back to Katoomba in February 1994 (from Vol.4, No.1) under the editorship of Keith Whiting. Initially, The Weekender was published monthly but, from issue 12, it came out fortnightly. 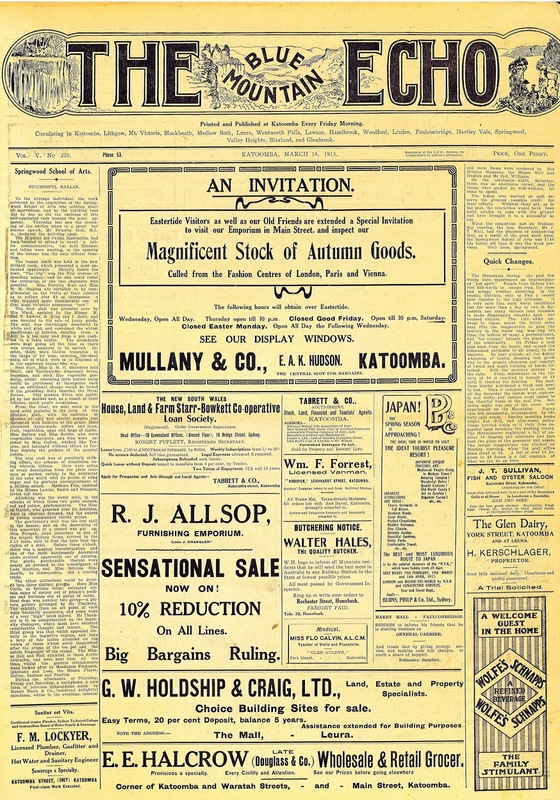 After the first few issues the paper circulated free throughout the Mountains from Penrith to Mount Victoria and, by the end of its life, had extended its distribution to the Lithgow area. 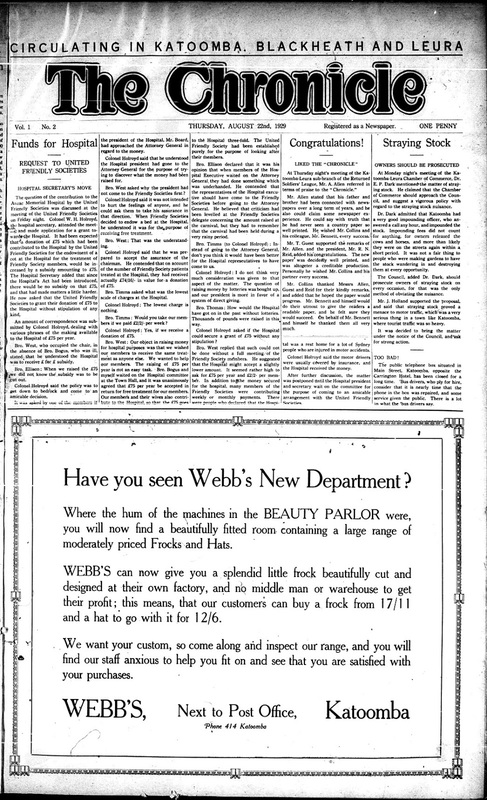 For most of its life the paper was published in a magazine format. However, from March 1993 (Vol.2, No.1) to November 1993 (Vol.3, No.5) it appeared in tabloid newspaper format. The Weekender began with a substantial component of community news and opinion, though its content was eventually dominated by leisure and lifestyle activities. Vol.1, Nos.1-24, September/October 1991 – 20 March 1993. Vol.2, Nos.1-12, 21 March 1993 – 4 September 1993. Vol.4, Nos.1-23, 13 February 1994 – 31 December 1994. This small, monthly, free community newspaper was published in Woodford by Jane Clements and Sharon Fray and edited by Jane Clements. Its aim was to foster a sense of community through informed news, issues and comment. Though it initially circulated from Winmalee to Lawson, by the early issues of Volume 2 it was being distributed between Valley Heights to Katoomba. The paper was published in magazine format up to Vol.1, No.3, after which it appeared as a tabloid newspaper. The first issue of this paper appeared under the title THE MID-MOUNTAINS VILLAGE VOICE and was numbered Vol.1, No.1. With the second issue the title was changed and the numbering re-started. Vol.1, Nos.1-6, July 1996 – December 1996. Vol.2, Nos.1-7, February 1997 – August 1997. After circulating for three years in the Hawkesbury district as The Hawkesbury Independent, in September/October 1997 the publishers, Jemshaw Pty., Ltd. of South Windsor, produced companion editions for Penrith and the Blue Mountains. In November 1997 these three editions were combined into one regional edition, distributed free throughout the Hawkesbury, Penrith and Blue Mountains areas. Then, from the issue of July 1998, special editions for each of the three areas were again produced. The Independent is published monthly. Its content covers issues relevant to the three local government areas and feature articles of general and tourist interest. The cover photograph was taken by Katoomba photographer Arthur Manning in the mid-1930s. It depicts the arrival in Katoomba of five young Leeton women who were cycling from their home town to Sydney. Also in the photograph are (L to R) Jack Maddock, reporter on The Blue Mountains Times, possibly Bill Coventry, Speedwell’s agent in Katoomba, Harry Drake, reporter on The Katoomba Daily, and Jim Tyley, lino operator and part-time reporter for The Katoomba Daily. The identity of the young boy is unknown. BENNETT, Joseph Matthew. Moved his family to Katoomba ca.1918 and worked for a few weeks on “The Blue Mountains Echo” before taking a position with “The Mountain Daily”. By February 1920 he had become the printer and publisher of that paper. Printed and published “The Blackheath Beacon” 1930-1931 and “The Blue Mountains Times” 1931-1937. BENNETT, J. Ralph. Son of Joseph M. Took over much of the responsibility for running the family business (which included “The Blue Mountains Times”) from about 1934 when his father became ill. In 1973 the Blue Mountains Historical Society published his booklet titled “Blue Mountains Newspapers” which has provided a wealth of useful information for later researchers. BROOMHEAD, FRED. Was on the reporting staff of “The Blue Mountain Echo” for about two years (ca1912-13). Resigned in January 1914. BUCHANAN, Charles Gordon. Was on the staff of “The Blue Mountain Echo” in its early years. By July 1919 he had become the printer and publisher of “The Mountain Daily”. CHRISTIE, Lorin Grant. Proprietor/publisher of “The Blue Mountains Times”. GORNALL, Robert. Purchased “The Blue Mountain Gazette” in January 1904. During his time in Katoomba he was closely involved with the Katoomba Town Band. He closed the paper in December 1904 and moved to Kurri Kurri where he founded the “Kurri Kurri Times” in January 1905. Bennett claims he was the founder of the mysterious “Observer”. HART, Peter Giles. Born ca 1863. Had experience in the printing trade in Melbourne and Sydney. In January 1895 he purchased “The Mountaineer” from Robert Moss. After selling the paper to his brother-in-law John Knight in May 1904, Hart moved to Rylstone where he incorporated “The Rylstone Star” with “The Rylstone Express”. He later returned (1907/8?) to the Blue Mountains and established the Federal Printing Works in The Mall, Leura. His wife, Rosanna, was a guesthouse proprietor (“Hurlstone” in The Mall, Leura). He died on 2 September 1946 and is buried in the Methodist section of Katoomba Cemetery. HICKSON, W. Proprietor and publisher of “The Enterprise”. He had earlier worked as a machinist on “The Blue Mountain Echo”. KNIGHT, Alfred E., younger brother of John Knight. At the time of his marriage to Annie Dunford of Bathurst in March 1910 he was foreman printer at “The Blue Mountain Echo”. KNIGHT, John. Born …? The son of Rosanna and John (Sen.) who arrived in Katoomba in the early 1880s. Before purchasing “The Mountaineer” from Peter Hart in June 1904, he had been associated with the paper for about eight years, including a period as acting manager. He served his time as a printing apprentice in the “Mountaineer” office and also gained experience working in the Government Printing Office and a number of other establishments in Sydney. At the end of 1908 he disposed of the business to the newly floated “Mountaineer Printing and Publishing Company, Ltd.” He then appears to have moved to Ryde. Bennett claims he was associated with the mysterious “Observer”. LOWDEN, W. Lawson businessman (auctioneer, real estate agent, photographer, publisher) who published the short-lived “Lawson Post” in 1909-10. In 1905 he published “The Official Guide to Lawson, Hazelbrook & Woodford”, a tourist guidebook “profusely illustrated” with many of his own photographs. MATHIAS, Victor Yeoman. Editor of “The Blue Mountain Star” 1929-1930. MAHONEY, James Arthur. Formerly edited the rural weekly The Farmer and Settler, bought The Courier in 1953 which he published and edited until 1959. In 1960 he returned to rural journalism as sub-editor of The Land, where he stayed until his death in 1960. Source: James Mahoney (son) letter to BMG, 27 Feb, 2013. MOSS, Robert. Born ca 1834. Possibly arrived in Katoomba during the 1880s when, according to Ralph Bennett, he started the first Blue Mountains newspaper, “The Mountain Advertiser”. In September 1894 he began “The Mountaineer” from offices in Main Street, Katoomba. He sold the paper in January 1895 to Peter G. Hart. Moss and his wife, Isabella, ran a guesthouse (“The Pines” – now “St. Mount”) in Blackheath. He died on 23 September 1906 and is buried in the Church of England Section of Blackheath Cemetery. SMYTHE, Robert Villiers. Arrived from North Queensland to take over the editorship of “The Blue Mountains Echo” on the retirement of J.C.Hart in February 1910. He was editor until 1925(?). Married Ida Webb in 1916. He was an expert rifleman, a member of the Katoomba Rifle Club and a winner of the Blue Mountains Championship. Elected to the Katoomba Municipal Council …? Served as Mayor in 1918 and 1919. SOUTHWOOD, J. Albert. Took over “The Katoomba Times” in partnership with G.P.C. Spring in September 1890. In 1894 he moved with Spring to Kadina, South Australia, where they founded “The Plain Dealer”. SPRING, George P.C. The son of George William Spring. Born …? With J.Albert Southwood he took over “The Katoomba Times” in September 1890 after his father’s retirement. After he and his partner had closed the paper down in 1894, they moved to South Australia where they established “The Plain Dealer” in Kadina. SPRING, George William. Founded “The Katoomba Times” in April 1889 in Main Street, Katoomba. He retired from the paper in September 1890, allowing his son George P.C.Spring and J.Albert Southwood to take over. As well as being proprietor of the “Times”, Spring’s other business interests in Katoomba included a newsagency, supplying a variety of popular newspapers at the railway station and from his office, and a real estate agency in which he offered his skills as an auctioneer and general commission agent. He was drowned in February 1891 after falling overboard from the S.S.Barcoo while returning to Sydney from Melbourne. TONKIN, W.J.K. Came from Brisbane to join the reporting staff of “The Blue Mountain Echo” in January 1914. WILSON, E.D. Founded “The Blue Mountain Gazette” in January 1903. Sold it to Robert Gornall in January 1904. The photograph was taken by Katoomba photographer Albert Manning in the mid-1930s. It depicts the arrival in Katoomba of five young women from Leeton who were cycling from their home town to Sydney. Also in the photograph are (L to R) Jack Maddock, reporter on The Blue Mountains Times, possibly Bill Coventry, Speedwell’s agent in Katoomba, Harry Drake, reporter on The Katoomba Daily, and Jim Tyley, linotype operator and part-time reporter for The Katoomba Daily. The identity of the young boy is unknown. The women are identified in the cutting as Misses Daisy Transton, Elma and Joyce Eurell, Molly Dunne and Beryl Burns. Content Licensing: Attribution, share alike, creative commons.